Our range of concealed shower valves will give your bathroom a cool designer appearance. These smooth, uncluttered designs are perfect for trendy settings whether they're modern or traditional. We supply concealed thermostatic shower valves from a range of top bathroom brands. 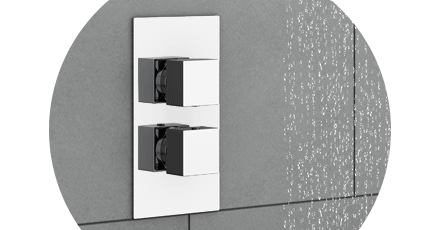 The recessed valve is hidden but leaves a stylish panel with controls for the shower. These stylish brands manufacture concealed shower valves in a range of stunning colours and finishes including chrome, nickel, gold, black and white.